Hawaii To Calcutta: A Tribute To Tau Moe explores one of the most unexpected and mysterious untold stories in the history of the guitar: how it arrived in India from Hawaii and was popularised by one man, Hawaiian slide guitar legend Tau Moe. The story of the Hawaiian slide guitar's arrival in India is every historian's dream- a twisting tale of great wonder and subtle mystery. 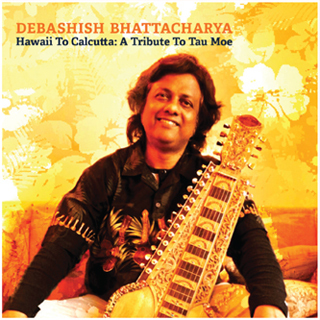 Hawaii To Calcutta: A Tribute To Tau Moe is Pandit Debashish Bhattcharya's dedication to Tau Moe, veritable musical folk legend and one of the first to introduce the instrument to India's enthusiastic shores. Tau (1908 - 2004) was born in Samoa and raised in Hawaii. With his wife and children, Moe travelled the globe for over sixty-one years, undertaking an unbelievable odyssey and igniting leftfield musical fires wherever he fared. Tau originally worked as a steel guitar player at the Royal Hawaiian Hotel. In 1927 whilst working at said Waikiki establishment he met Rose Kahou, a singer and dancer. Tau and Rose married and shortly joined Madame Riveiere's Hawaiians with which they toured to Manila. Within two years, the couple had broken away and were billing themselves as The Tau Moe Family. Their early adventures took them to Japan, China, Southeast Asia, Philippines, Indonesia, Pakistan, Burma and of course India. It was in Calcutta that they would light the musical torch that Debashish Bhattcharya still holds high to this day. The Moe family lived in India for several years, performing, teaching and collaborating with local musicians all the while. Tau's mellifluous slide guitar vernacular was indelibly popular with Indian audiences and musicians alike. The former attracted to the group's undoubtable musicianship, perceived 'exoticism' and no doubt leaning on a global interest in colonial Polynesia and the then contemporaneous fad for 'Tiki' culture. The latter, learned pandits and their curious students saw the slide guitar as a new vehicle for raga: an instrument able to traverse the sinuous microtonalities of Indian music's finest frontiers. During their time in Calcutta the Moe family played for the nation's high society, no less than Mahatma Gandhi and Rabindranath Tagore included. Tau's most famous student was Garney Nyss. A polymath: premier cricketer, hockey champion, ground-breaking photographer and talented musician, Nyss founded The Aloha Boys and made approximately sixty sides of Hawaiian music for HMV in the 1940s. Nyss and Debashish's childhood guitar teacher Rajat Nandi were great friends and musical sparring partners. So it is, via such direct creative arteries, that Debashish's own sound is so deeply bound to the wondrous Moe family lineage. Debashish began playing on a standard six-string acoustic Hawaiian steel guitar at the age of three. Born into a family of Gwalior classical singers, his early musical awareness was shaped by their tender focus on tremolo, pitch shading and the intensely nuanced ornaments of beautifully rendered raga. His journey to professional musicianship was astral, prodigious in its projection and much too epic to contain within these sleeves. By the age of four he was performing on national radio, by the age of six he was studying under Rajat Nandi. At twenty-one he began ten years of intensive apprenticeship with his guru, Pandit Brij Bhushan Kabra. An explanation of Debashish's signature scorch on the landscape is not complete without comment on his revolutionary altering of the Western guitar in order to fully express his own unique sonic universe. He is the inventor of the Chaturangui, Gandharvi and Anandi guitars; each instrument distinctive and expressive in its own right. In 2004 Debashish took his second trip to Hawaii and performed in Laie where Tau Moe then lived. Debashish describes the meeting best; 'Papu Tau was in his nineties. Even after being away from India for almost sixty years, he spoke beautiful Bengali ... He shared with us many stories of his amazing life and gave me his blessing. As long as I live that meeting will remain one of the highlights of my life'. Tau Moe's vibration resonates deeply through the central chakra of this album as we hear Debashish's musical genius playfully and gymnastically stretch across popular Hawaiian repertoire. 'Aloha 'Oe' is one of the most widely circulated songs in Hawaiian history. Composed by Queen Liliuokalani in 1878 on visiting the Maunawili mountain ranch, the love song is here reinterpreted by Debashish and Bobby Ingano in pitch-bending languorous splendour. Seemingly misnomered 'Hawaiian War Chant' is an upbeat and peppy number. Written by Prince Leleiohoku II in the 1860s, this track also known as 'Kaua I Ka Huahua'i' became popular again in the 1940s as a swing jazz number. 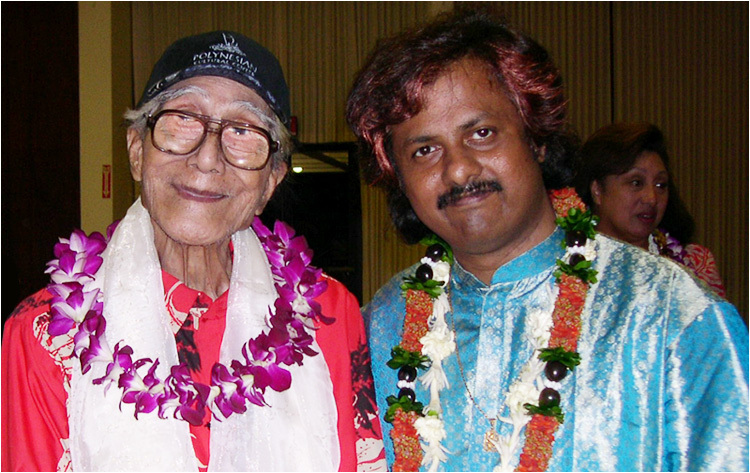 Debashish is joined here on ukulele by Benny Chong, one of Hawaii's most highly regarded musicians and arrangers. Debashish's interpretation of 'E Ku'u Morning Dew' written in the 1970s by Eddie Kamae spotlights the gentle rootsy end of Hawaiian style. The rendition features Debsahish's brother Subhasis on percussion and Jeff Peterson on accompanying guitar. Unfolding the casing of this album, sonic luxuries for the listener surely await. This record was captured during Debashish's many visits to Hawaii in the company of his dear friends and musical conspirators. Revel in auditory melisma, as Pandit Debashish Bhattcharya immerses himself in great tribute to Hawaii, the golden land of the slide guitar.